When you’re living in an age that is notorious for its dependence on smartphones and new technology- and where we face criticism for this dependency it’s often difficult to see the positive side of our reliance of technology. Every day, we are changing and modifying how we live our lives thanks to new apps and electronic devices that help us with banking, checking the weather and most recently, keeping up to date on our health. Mobile health, or mHealth as it is also known, is having a big effect on how we, as consumers, track our own health - and its affecting the industry immensely. From wearable devices such as Fitbits, and smartphone tools such as Apple’s “Health “ application, keeping track of your health while has become easier than ever. Michael Shreve, the director of Health Information Systems at the MedicAlert Foundation of Canada, believes that mobile health is going to have a dramatic effect on how healthcare is delivered. The MedicAlert Foundation is a Canadian charity that maintains over one million Canadian health records for first responders. In 2015, Mohawk College’s mHealth & eHealth Development and Innovation Centre (MEDIC) worked with the MedicAlert Foundation of Canada to create an app, available for iPhones and Android, which pushes boundaries in the field of mobile health. Intended for first responders in the field, the app allows them easy access to MedicAlert member information. Currently, the information is only available via the 24/7 MedicAlert telephone hotline, where trained professionals have access to over a million electronic health records. With the introduction to the new app, paramedics can access the information on their device instead of having to listen to an operator and take notes. The app is different from other healthcare applications because of its efficiency in delivering MedicAlert’s member’s information to first responders. 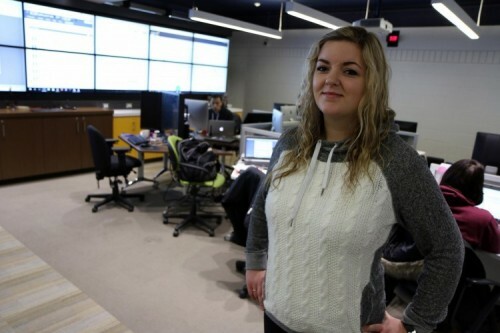 Working with Shreve on the project was Tara Oskam, an Advanced Diploma Software Development student at Mohawk College and a co-op student at MEDIC. She considers the way the app was designed as a very important feature. According to Oskam, this app is a phenomenal example of how mHealth is beginning to affect the world of digital health and health care. “Let’s say someone is incoherent and couldn’t tell paramedics what their allergies are, but are severely allergic to a certain pain medication, now the paramedic would know that and wouldn’t administer it on the way to the hospital,” explains Oskam. But what exactly does the future of mHealth hold? It has already begun to changed the world of healthcare, and according to Shreve, will continue to do so exponentially over the next several years..
“mHealth will enable a dramatic shift in how healthcare will be delivered in the future,” says Shreve. Blake Mancini is final year student in Mohawk College’s Journalism program. He is completing his internship with iDeaWORKS, Mohawk’s department of applied research and innovation. Mohawk College educates and serves 30,000 full-time, part-time, apprenticeship and international students at three campuses and two City School locations at the Eva Rothwell Resource Centre and the Central Public Library in Hamilton, Ontario. Mohawk has ranked first among all Greater Toronto and Hamilton Area colleges in student satisfaction for seven consecutive years and first in graduate satisfaction for the past five years. Mohawk ranks 15th among all colleges in Canada for applied research activity and has been named among Canada’s greenest employers and the region’s top employers for the past three years.